For anyone who did not read the previous installments, I made a goal to paint my nails at least once a week this year. Installment one went over my polish collection among other things. Then, I embarked on the challenge in the next installment. If you want to join my in the challenge, follow along here or you can visit the Beautytalk challenge. Nail polish Saturday was born. If you’re looking at the calendar, you realize it is Sunday. No worries though, because I did paint them yesterday and just waited until today to share them. Julep released a lovely new color named Becky. Gwen (a BeauyTalk friend of mine) mentioned Becky looked similar to Blakely. I had not yet used Blakely even though I owned her. After discussing the two with Gwen, my first plan was to paint one hand in Becky and the other in Blakely to compare the two. Once Becky started arriving for people, I noticed she was swatching differently than I had seen Becky swatch. Fearing a mismatched manicure, Gwen suggested I do Blakely on the ring finger of each hand and Becky on the other fingers. It was a great idea, so that is exactly what I did. 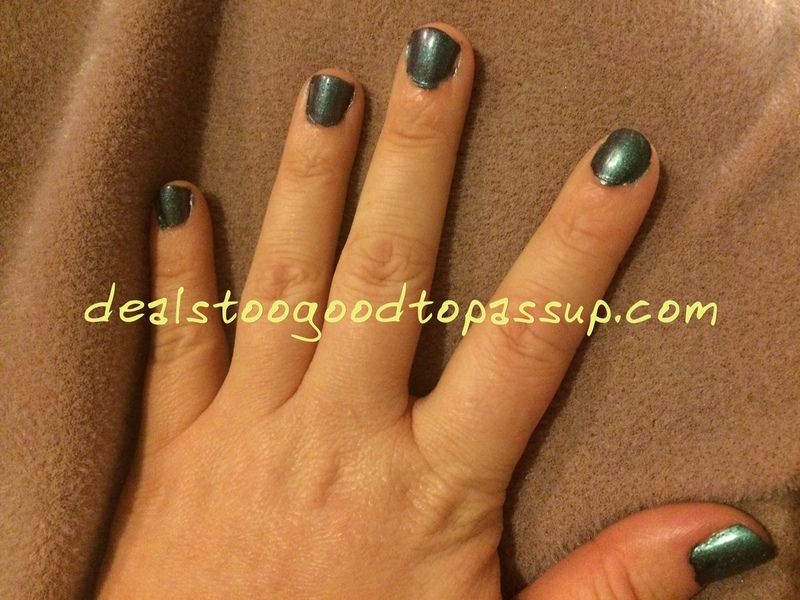 I started with a Julep Oxygen base coat (currently my favorite). It dries fast, smooth, and matte. With its whitish tint, it also helps bring out the color in the polish a bit more than a clear base coat. One coat of Becky on 8 fingers and 1 coat of Blakely on 2 fingers were all that I needed. They’re both highly pigmented. This is a swatch of Becky, but Blakely looks almost exactly the same to me. 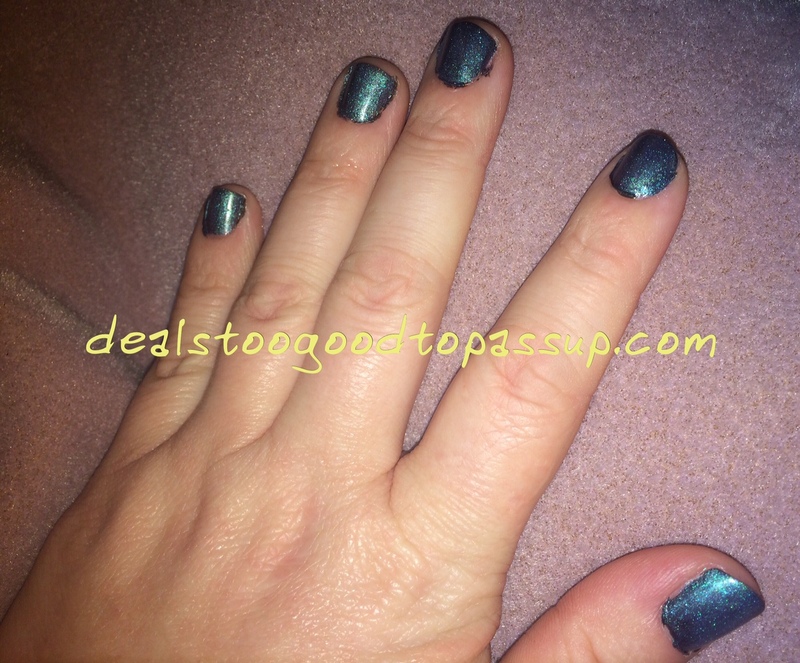 It has a purplish gray base color with emerald green glitter. Compare this to my other purple polishes. I topped them with Bjork, which is a metamorphic topcoat. She is whitish with a blue tint. Compare this to my other Nail Treatments, Base Coats, and Top Coats. Before I knew it, the very slight blue tint was giving Becky and Blakely a bluish overall color. I cannot really tell the difference between Becky and Blakely. Can you? The polish looks messy, but I always scrape it off the next day in the shower when my skin is soft and the polish is completely dry. If you have shaky hands, removing the polish when it’s still wet or your skin is dry is difficult and usually messy, so try this. The theme for this week’s challenge is Winter’s Last Hurrah. 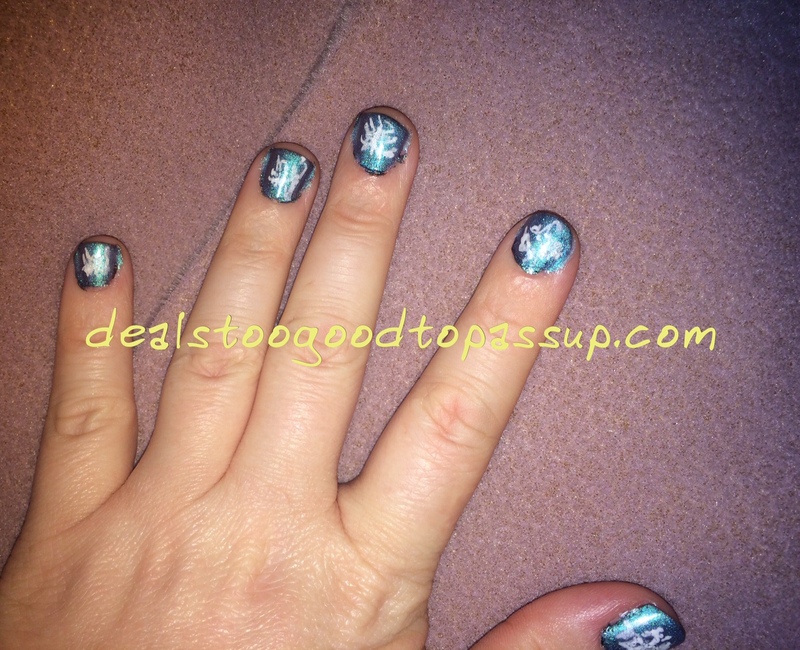 Since my nail color was leaning blue, I thought it might be fun to draw some snowflakes. Some may remember that I received a large GWP from Drugstore.com recently (it’s now sold out, but I will alert you when I read of the next one). It had a Sally Hansen Nail Art Pen in white nail inside that I decided to try. For those of you who know me as notcreative, you may already know that I lack any talent whatsoever. Despite my inability to draw, I took a stab at the snowflakes. After using the pen, you’re supposed to add another topcoat to seal your drawings. I decided to use Bjork again, because I like how she transformed the polishes. By the second coat of Bjork, and I would have sworn the polish was blue to begin with. While I am not happy with my drawings (neither is my husband), I love the final look of the polish. These topcoats are awesome, and I am definitely in love with Becky and Blakely. Most weeks, I will allow the readers to pick my polish as Nancy picked week one and Gwen picked week two. Week three starts on Valentine’s Day, so I am going to pick my polish that week. If you would like to pick week four, I will tally any votes received here and on next week’s article. Majority rules. If each polish only gets one vote, I will use the one picked first. Thanks for following along. Just remember that I will only consider ones I have not tried before (excluding base and top coats), because my goal with this challenge is to use new polishes until I have used them all. 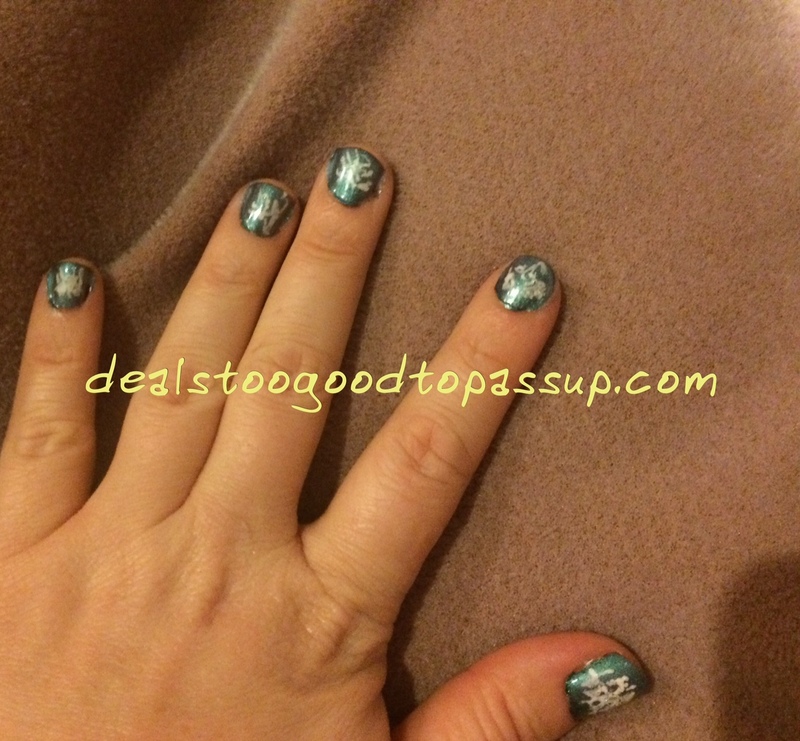 See all nail polish and Challenge articles. View my main page for the guide map to the site and deeper deal exploration.